Posted on Dec 23, 2011 by Appleton Downtown Inc. 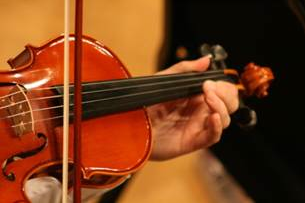 The Fox Valley Symphony Orchestra Association is sharing the gift of music this holiday season. Small groups of musicians will be performing at public venues in the Fox Valley region. Not your typical venues, these include fitness centers, restaurants and grocery stores. Operation Overture will give free public performances where you might least expect to find a symphony. We're celebrating a milestone year with our 45th anniversary and we really want to share our celebration with people throughout the community, says Development Director Julie Filapek. A project grant from the Community Foundation for the Fox Valley Region helped to attain this goal, which has been on the Symphony's wish list for some time. We love connecting our orchestra with the public, says Director of Operations Jamie LaFreniere, and this grant makes it possible without worrying about costs. This is as much a gift for us as for anyone enjoying the music. Executive Director Rosie Cannizzo explains, We love it when you join us at the Performing Arts Center for our regular concerts, but with this program, instead of making you come to us, we're bringing the Fox Valley Symphony to you. I hope it's a wonderful surprise for people to show up at the grocery store to do their shopping, and then discover they get to listen to some great music performed by symphony members who also happen to be their neighbors, teachers, and friends. Operation Overture will continue through the 11-12 season.